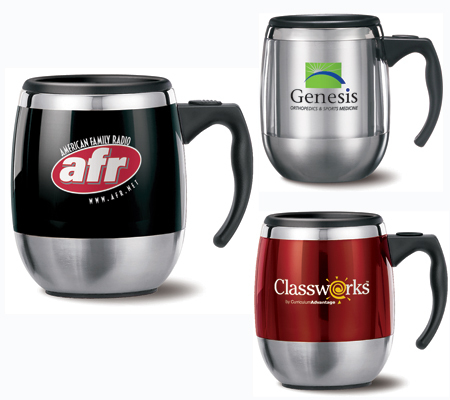 You may order our custom-imprinted stainless steel coffee mugs with any design, copy, and imprint colors you choose. Our 14 oz. "VisionSteel" mug features a unique blend of stainless steel and plastic copolymer. The mug has a polish accent, brushed finish, contoured handle, and comfortable thumbrest, which create a masterpiece. Our Stainless Steel Mugs are available in 15 imprint colors, including Green, Process Blue, Reflex Blue, Maroon, Teal, and Grey. VSOM408 14 oz Squire Steel Desk Mug (One Color) Standard Production 9.45 9.25 9.05 8.95 12.45 10.95 1-7/8" 2½"
It's easy to have your own Stainless Steel Mugs. Simply call 1-800-233-0828 and submit your camera-ready artwork to graphics@kardwell.com (you can also mail your art). The minimum order is just 144 custom imprinted mugs. You will receive your promotional mugs in about 3 to 4 weeks. Rush delivery is available. For a FREE Catalog or information on custom imprinted glassware, please contact us at 1-800-233-0828.